Will we see more unconventional play-calling versus Florida in 2015? 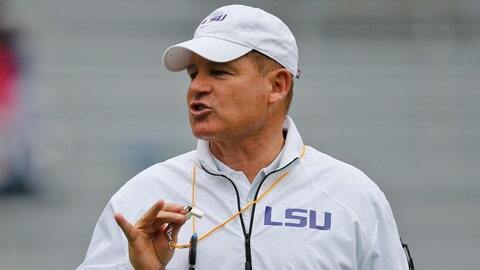 There’s a reason LSU head coach Les Miles is affectionately called "The Mad Hatter." His quirky personality, grass-eating habit, and penchant for dialing up trick plays directly correlates with the nickname. In 2010, the then-No.12 LSU Tigers appeared to be attempting a 53-yard field goal with only 35 seconds left in a contest against No. 14 Florida. A conversion would have tied the game. Instead, Miles dialed up a fake-field goal call. Holder Derek Helton took the snap and proceeded to toss the ball over his shoulder. Kicker Josh Jasper caught the ball and scampered for the first down. LSU then punched in a touchdown a few plays later for an exciting 33-29 win. In this year’s installment of the rivalry between LSU and Florida, will we see similar fireworks? One can bet Miles has a trick or two up his sleeve for a similar situation.